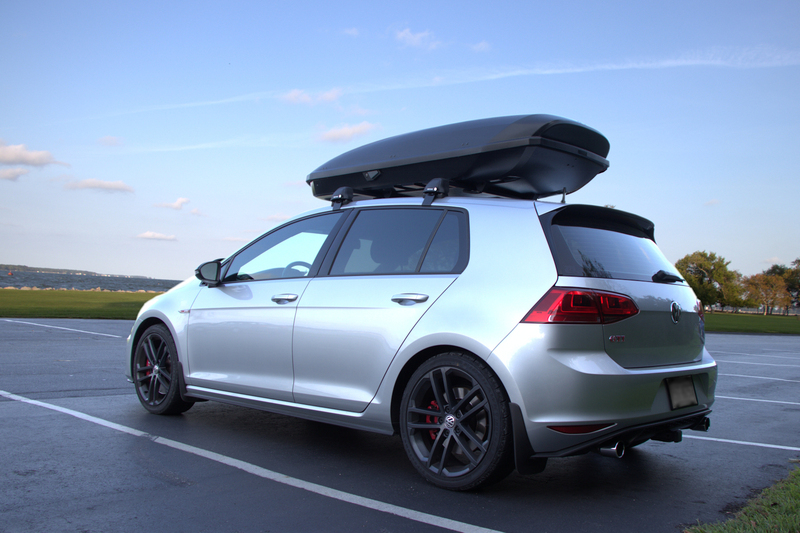 ← Getting Stoned With My GTI! 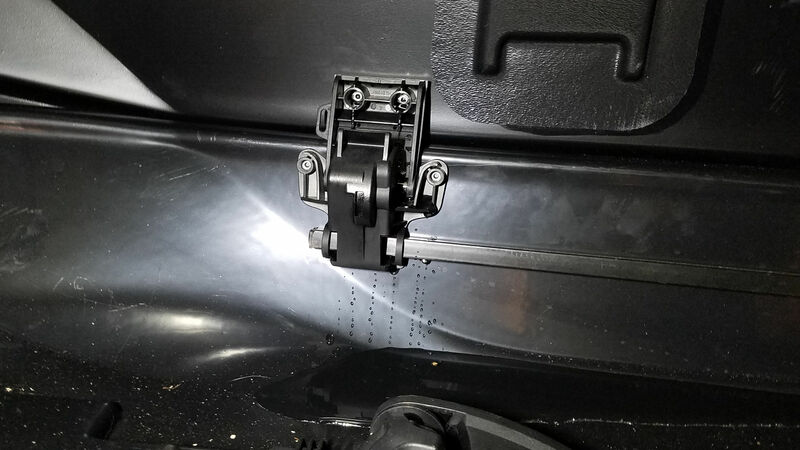 If you’ve read my Long-Term Review of the Showcase 15, then you know that I was extremely disappointed to discover that many of its rivets leak during even light rainfall, causing the bottom of the box to pool with water. Imagine my surprise to learn that the rivets are also made of plastic and have no sealing precautions whatsoever. That’s unacceptable in a $700 box! Sure, Yakima has its lifetime “We’ve Got Your Back Guarantee,” which includes free repair or possible replacement for the life of a cargo box. However, the customer is responsible for shipping to their facility in Washington State. That would cost me around $150 in freight charges for an item this large. And what if the “repair” is just more of the same leaky rivets? No thanks! Instead, I committed to finding a way to fix it on my own. I considered drilling out each rivet and replacing them with better rivets which feature an O-ring. However, one of my mild gripes about the Showcase was with its gloss finish. My first voyage with the box was with it mounted on my trailer. With the sun just right, the glare from the box into my rearview mirror was terrible. I could only imagine how it might appear to oncoming traffic, even if just for a short period. The gloss finish also revealed flaws in the surface in the form of little waves or dimples. I’m not sure if that was a defect in the paint or the plastic lid. Regardless, I had a solution to fix it: VINYL WRAP. I finally got around to attempting a wrap. Who knew it would be so difficult? I was in way over my head and essentially wasted a lot of wrap. I found a professional, This Guy’s Decals, who did the job for an excellent price. The work is not without a flaw or two. 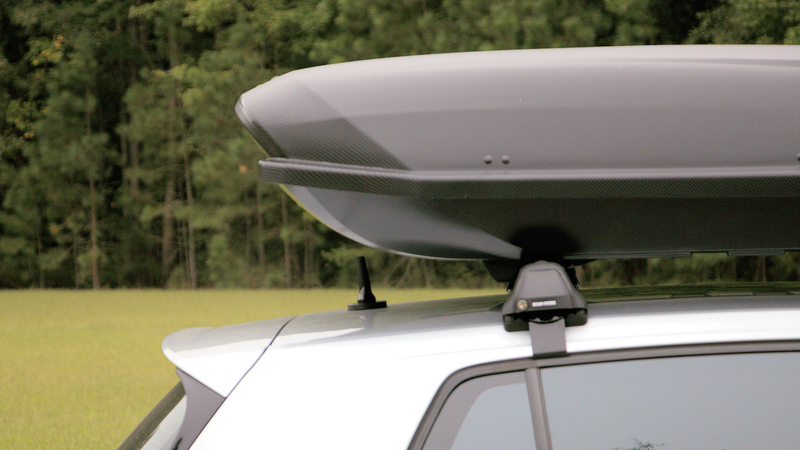 But let’s face it: a cargo box is a VERY odd surface with lots of curves, corners, and strange angles. Knowing that, I can easily live with a tiny wrinkle or two. Best of all, the leaks are resolved! The wrap completely covers all the lid’s rivets, leaving no path for water to seep through. The interior remains completely dry in the rain, even after a drive through remnants of Hurricane Florence. What’s not to like about that? 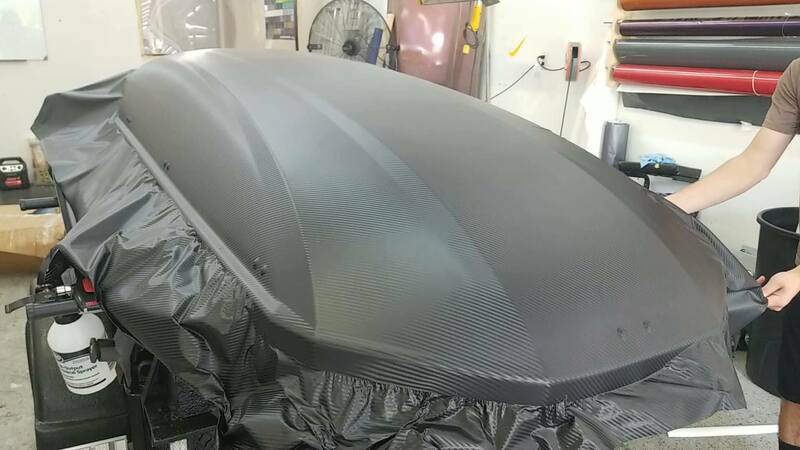 I chose a matte carbon finish. 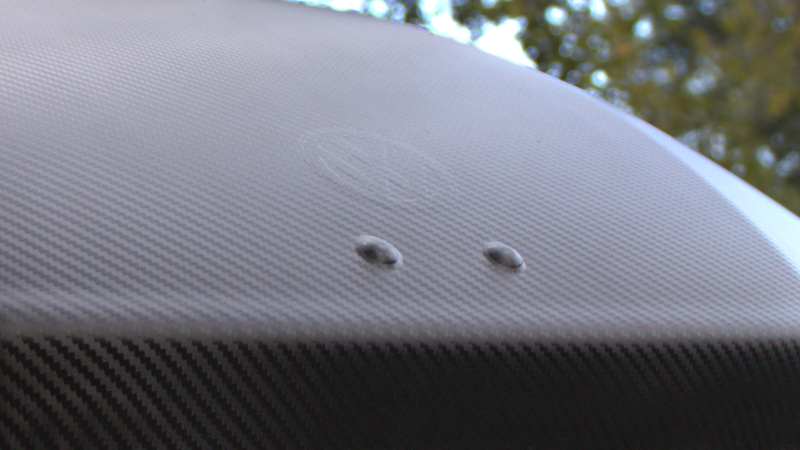 I’m not a carbon-look-fiend, but the look is a bit different for a cargo box. It’s not as plain as a matte black finish (my original choice), nor is it a bold color scheme. It suits me well. The logos had to be removed to give the tech a clean surface to wrap. The only exception was a VW logo sticker that I had stuck to the front of the box when it was new. I decided to see how it would look under wrap. See this image and judge for yourself. I like its subdued appearance. I also mentioned the lifting at the back of the lid at highway speeds. 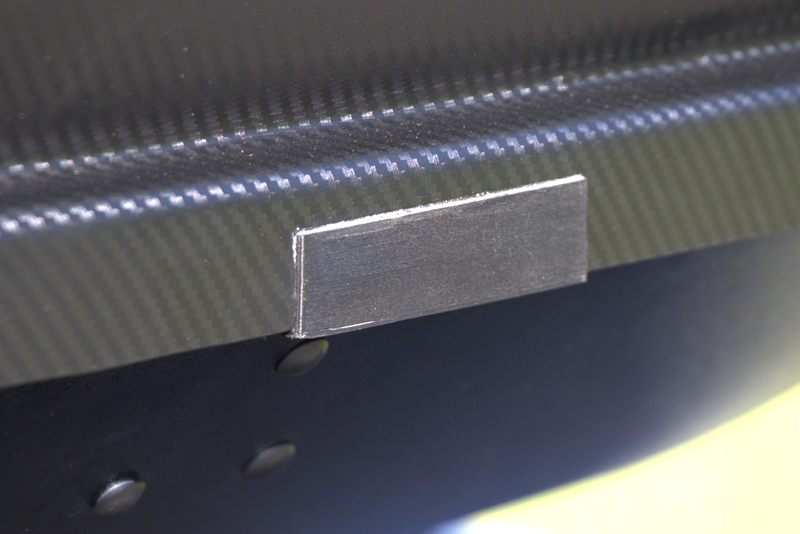 I solved that by putting a piece of aluminum angle bracket along the rear lower edge. Here’s an older photo of one of my 3D printed PLA test pieces. It worked well, but didn’t stand up to a few jolts when I forgot that opening and closing the box requires a different technique with the bracket in place. It’s a little inconvenient, but I like that the box now stays planted on the highway. 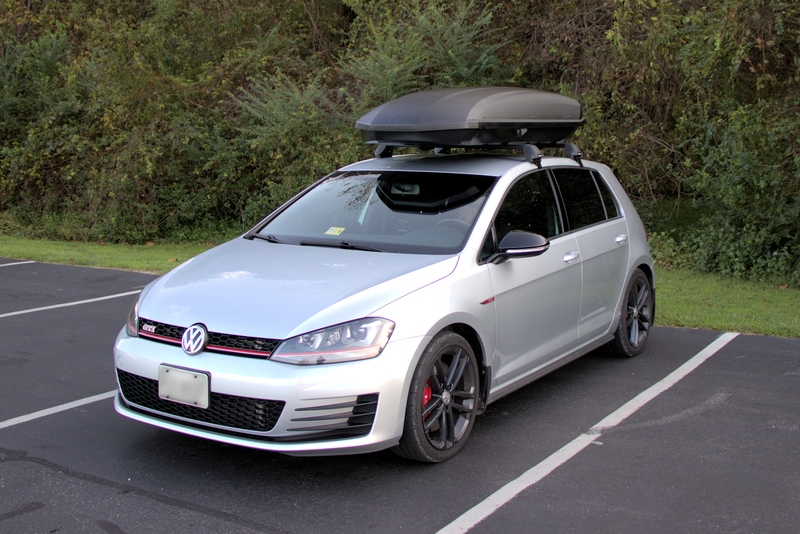 The cargo box makers that put clamps at the front and rear are solving a problem, for sure. Please feel free to ask any questions about things I may have missed. I’m happy to give answers.